Kitty Cantrell sculpture, A Mother's Calling. Protective mother polar bear surfaces to check on one of her more "independent" cubs. Mixed media sculpture is done in lucite. 3.5" l x 9.5" w x 11" h.
Dan Medina sculpture Amore. Two dolphins, encased in lucite, admire each other through the waves of love. Limited Edition of 350 with 35 Artist Proofs. All signed by artist. Size: 16.0 high. Kitty Cantrell sculpture Aquatic Ballet. They swim, they dance. Their movements are in unison. These three dolphins create an aquatic ballet every day. Approx. 7.5“long x 2"w x 6.5"high. Signed. Dan Medina sculpture Flow, 8 x 2.5 x 8.5 A uniquely shaped Lucite sculpture. Two dolphins swim magically through the sculpture. Artist uses Lucite to express the essence of water flowing freely. Free Shipping in U.S. - Kitty Cantrell sculpture Harmony. 11.5 x 4.5 x 18.2. Two otters swim playfully, one floating on top of the water. Artist signed w/Certificate of Authenticity by Starlite Originals. Kitty Cantrell, A humpback whale swimming in icy waters, calling out with his whale sounds, as he moves to the surface. Encased in Lucite with the shape of a whale tale. 4.5"L x 11.50"W x 7.5"h.
Kitty Cantrell sculpture Humpback Dance. Three humpback whales dancing throughout icy waters. Limited Edition 1750, Artist Signed. 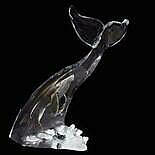 Size: 6.5"L x 9.0"W x 9.5"h.
Kitty Cantrell sculpture Humpback Calling. Mother humpback whale swimming through the polar waters with her new baby, carefully keeping close together as they feed on a morning’s delight of krill. 12.5"h.
Kitty Cantrell sculpture Intrepid Spirit. Two pewter turtles swim gracefully through the sea, encased by the Lucite® which surrounds their metal bodies. Approx. 12“long x 6"w x 18.5"high. 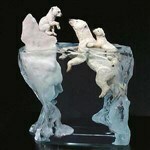 Free Shipping U.S.A. - Kitty Cantrell sculpture Life Lessons in Lucite. Mother Bear teaching her cub the right way to catch fish for dinner. Signed with Certificate of Authenticity. Ltd Ed 950. 4.5" l x 11.5" w x 7.5" h.
Kitty Cantrell sculpture Majestic Spirit. Buck Deer embedded in frosted Lucite. Approx. 7 x 5.5 x 8.5. Artist signed, Certificate of Authenticity by Starlite Originals. Artist proofs limited to 125 pieces. Kitty Cantrell, mother and her offspring have found a new living space in the northern Arctic waters. Orcas shown swimming together in a sea of lucite. Approx. 7.5"L x 7"H x 2"D. Limited Edition of 1250. Kitty Cantrell Orca Wave Killer Whale Sculpture. Two Orca Whales, Mother and Calf are swimming together in a wave of lucite. Approx. 6.5"L x 4.5"H x 2"D. Open edition. Dan Medina sculpture Encompassed. Two graceful whales, encased in lucite, dance through waves that mirror the circular pattern of life. Ltd Ed of 750 & 75 Artist Proofs. Artist signed. Size: 8.5" l x 4.5"w x 11"h.
Free Shipping U.S. - Kitty Cantrell sculpture Playful Motion. 6.5“long x 4.5"w x 10"high. Three otters play joyfully through the fluid water. Signed w/Certificate of Authenticity from Starlite Originals. Collectible. John Cuevas sculpture, Point Break. 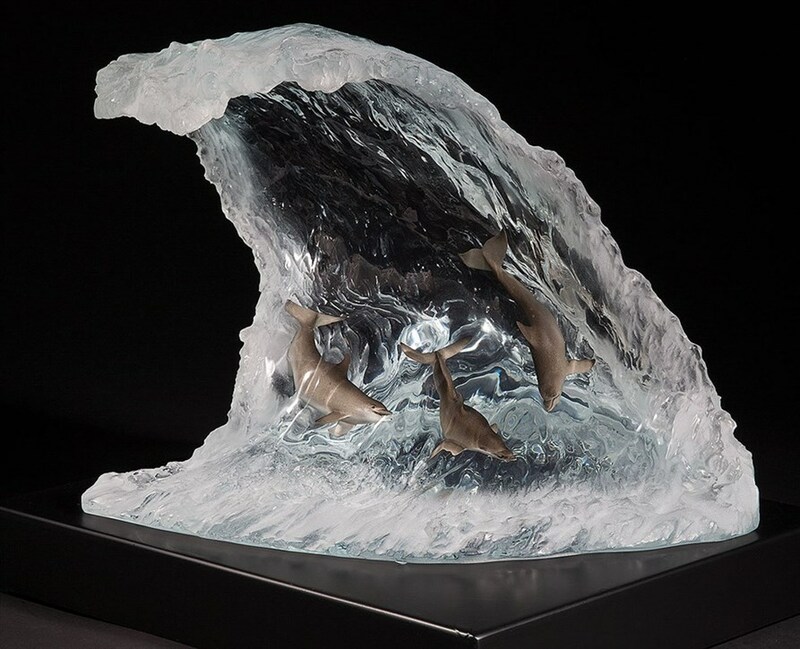 Three dolphins, encased in Lucite, swimming through a cresting wave. Limited Edition Size of 450, Artist Proofs 45. Official Certificate of Authenticity. Size: 11"l x 15"w x 11"h, 17 lbs. Free Shipping U.S. - Kitty Cantrell sculpture Royal Arabian. 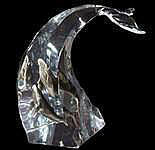 Pewter horse embedded in frosted Lucite. Approx. 12.5“long x 6"w x 14"high. Certificate of Authenticity, signed Ltd. Ed. Highly collectible. AP's. Free Shipping U.S. - Kitty Cantrell sculpture Sealed wih a Kiss. Mother and baby seal present an endearing moment as the Mom surfaces to the water to give her pup a kiss.9.0"w x 10.5"high x 4.0"deep. Free Shipping U.S. - Chris Pardell Disney sculpture, Strength and Honor. 16 x 6.5 x 16. 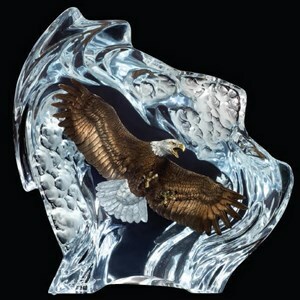 Captured in Lucite, a strong bald eagle poises himself in flight for a chance to grab his next meal. Signed. Kitty Cantrell sculpture Surfacing. Two humpback whales swimming whimsically throughout icy waters, happy that they have reached their destination and a new beginning. Approx. 11“long x 8.5"w x 11"high. Weighs a sustantial 25 lbs. Free Shipping U.S. - Kitty Cantrell sculpture Training Day. Mother Bear teaching her cub the right way to catch fish for dinner. Artist Signed with Certificate of Authenticity. 7" l x 15.75" w x 9" h. 4.5 lbs. Free Shipping U.S. - Kitty Cantrell sculpture Untamed Spirit. Pewter horses embedded in frosted Lucite. Approx. 14“long x 6"w x 10.5"high. Signed, Certificate of Authenticity for 95 Gallery Proofs.